A man trimming a tree in America learned the dangers of messing with Mother Nature the hard way. In a new YouTube video, the man is seen at the top of a ladder yelling, "I don't want to hit anybody, is everybody good?" He then cuts a branch and as it starts to fall it swings back towards him and throws him off the ladder onto the ground. A woman is heard screaming "911 or not?" She then runs over to the man. 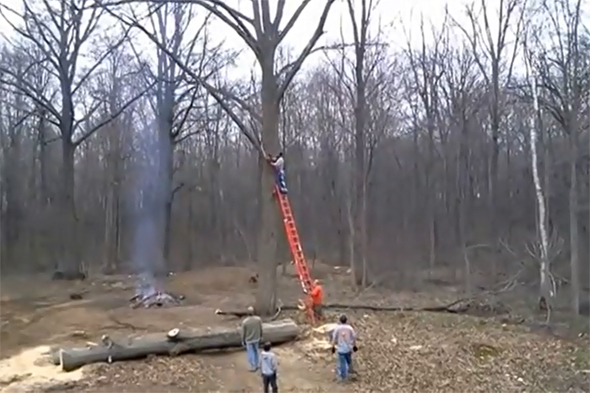 YouTube user Kurt Stepp posted the video on the social networking site and captioned it: "My coworker cuts down a tree and the tree is not very happy about it." The video has been viewed over 478,000 times and users have left comments advising Kurt's co-worker how he should have cut down the tree. 5. Not trying to use a chainsaw one-handed"
Another wrote: "You should always cut from a higher altitude from the branch, you should be looking down at it not up." Kurt later confirmed that his coworker escaped without serious injury.